SPACE Seating Professional AirGrid Back and Mesh Seat, 2-to-1 Synchro, Adjustable Arms and Tilt Tension Task Chair, Dark Grey by Space Seating at Momiji Studios. MPN: 5540. Hurry! Limited time offer. Offer valid only while supplies last. 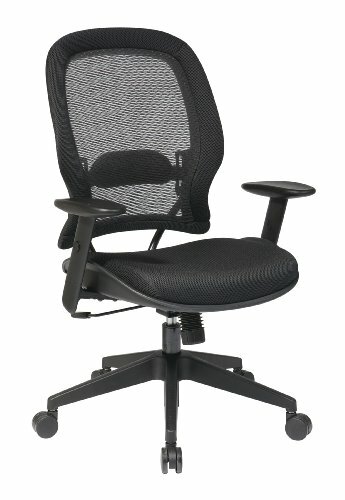 Air grid back and mesh seat Managers chair with adjustable angled arms, adjustable lumbar and angled nylon base. Optional headrest (Hrm003). Air grid back and mesh seat Managers chair with adjustable angled arms, adjustable lumbar and angled nylon base. Optional headrest (Hrm003). pneumatic seat Height adjustment. 360 degree swivel. 2-To-1 synchro tilt. Tilt tension and tilt lock. Angled nylon base. If you have any questions about this product by Space Seating, contact us by completing and submitting the form below. If you are looking for a specif part number, please include it with your message.